Contact Careers Support Account Manager Custom Security Checks for QuickBooks and more! Bank compliant check printing at a fantastic low cost! MICR, HP PCL 3 GUI, PDF compatible! The HP 1112MX lets you print full color bank compliant checks at up to 7.5 pages per minute. Easy-to-use, this printer saves you 50-80% or more vs. buying pre-printed checks from banks and mail-order suppliers. And the 1112MX is equally adapt to handle all your everyday document and photo printing. Manage your finances and create fully customized checks with the included VersaCheck Platinum software. The HP 1112MX is easy-to-use and saves you 50-80% or more vs. buying pre-printed checks from banks and mail-order suppliers. Immediately begin printing bank compliant checks with the included VersaCheck® Paper Pack and our VersaCheck® Platinum check printing software. 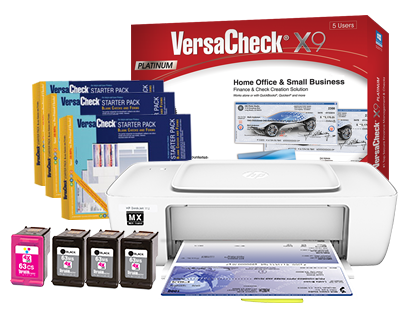 VersaCheck® Presto software & check paper included...everything needed to print your own checks! Supported operating systems Printer drivers included for: Windows® 10, Windows® 8, Windows® 7. Financial account validation available throughVersaCheckPay.com - allow 1-5 days to process. Printer compatible operating systems: Microsoft® Windows® 10, Windows® 8, Windows® 7. Apple® OS X v10.10 Yosemite, OS X v10.9 Mavericks, OS X v10.8 Mountain Lion. VersaCheck Presto compatible operating systems: Microsoft® Windows® 10, Windows® 8, Windows® 7. For Mac compatible VersaCheck software see VersaCheck for Mac. © 2019 Diversified Productivity Solutions, Ltd.
All product and company names are the property of their respective owners.